Chairs are custom made to order. Please allow ~6 weeks for production (not including shipping time). This is the perfect gift for alumni or distinguished faculty members! Made entirely of solid maple hardwood, this rocking chair features a steam bent scrolled-top crown in cherry finish with a laser engraved UBC crest, hand-painted gold beading on the spindles, and a comfortable scooped and saddled seat. Pricing includes shipping from vendor and pick-up at the UBC Bookstore or on-campus delivery. 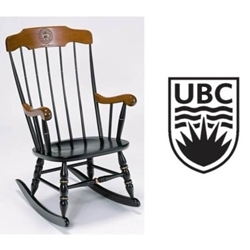 Want to present this chair as a gift before it arrives here at UBC? Use this page to print out a gift certificate! It's about on par with the Boston Rocker branded with SFU's crest. Quality was absolute rubbish. The rocking frequency was far too high! Chair failed within a week. Could not even hold the weight of my 4 cats, pint of Ribena and myself. On plus side this chair burned with a lovely scent in my chimney.